The purest, hardest performing and most rewarding naked sports motorcycle available today. 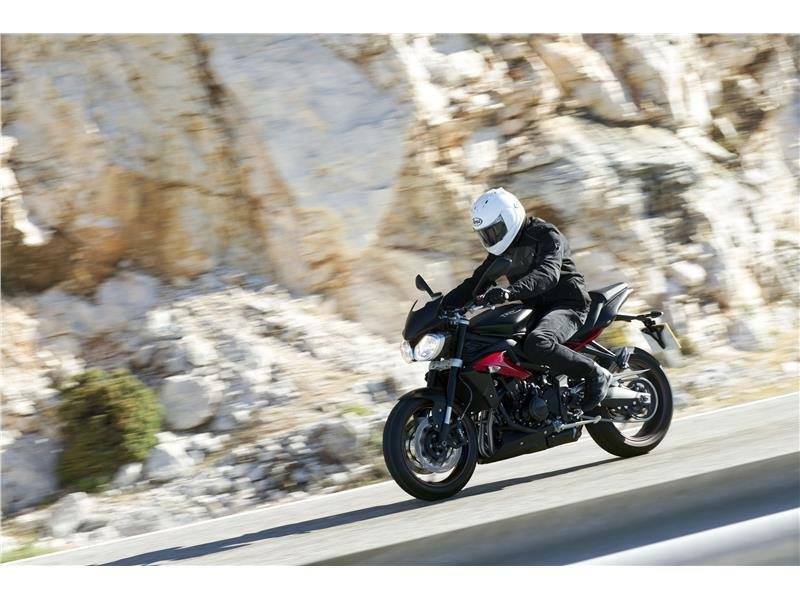 We took the Speed Triple, the world's first and best factory streetfighter with its head-turning, angry style and its 135 PS three-cylinder engine. Then added the best components the motorcycle industry can offer, from Öhlins, Pirelli and Brembo. A variety of exquisitely designed accessories complete the R transformation – flyscreen, bellypan and seat cowl, while the Diablo Red radiator shrouds further boast of the R’s pedigree. 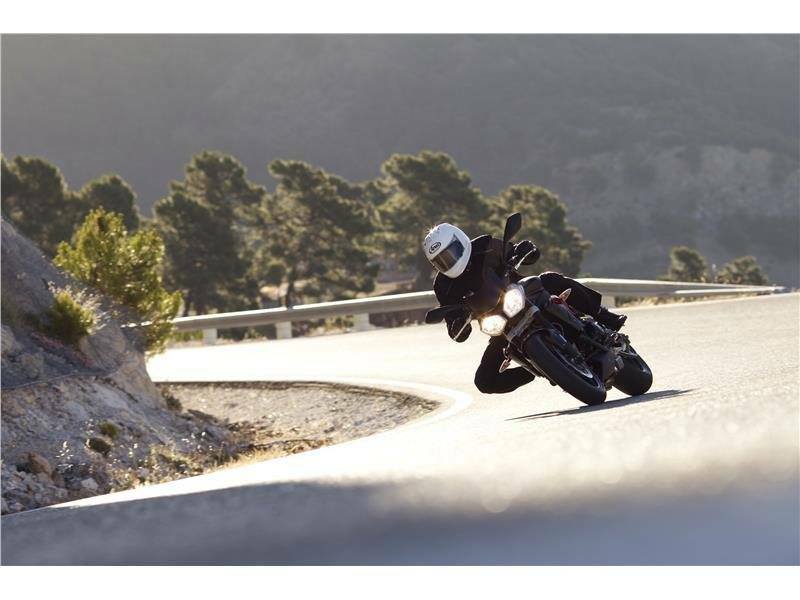 The result is the Speed Triple R, cutting edge real world performance to thrill the most committed rider. 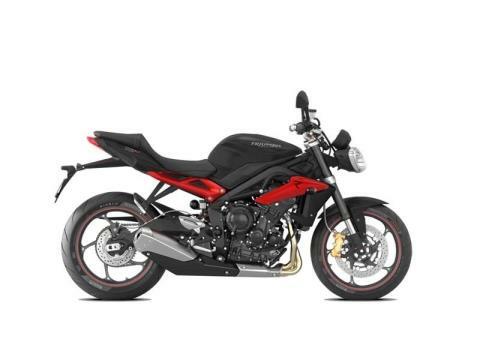 Based on the already high performing and agile Speed Triple. The R gives you sharper steering and even better feedback for the most intense, tactile and satisfying ride from any Triumph ever made. 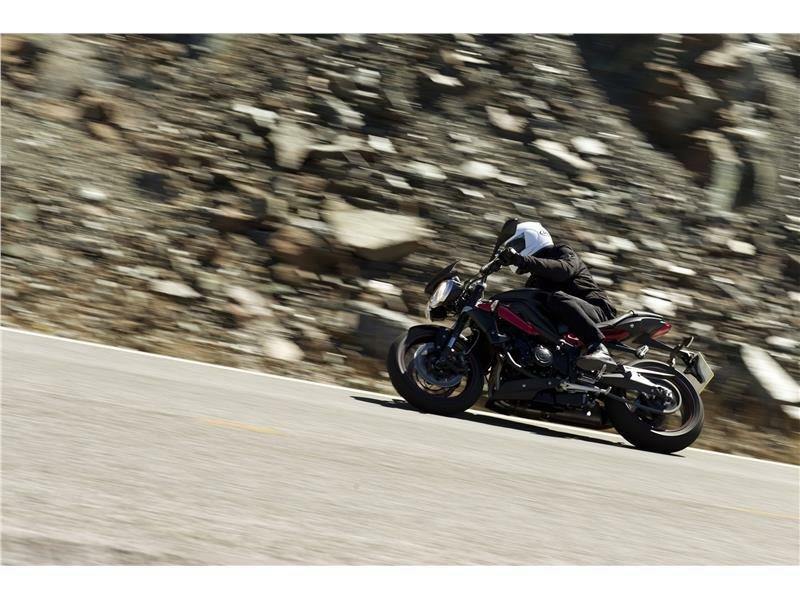 The Speed Triple never tried to hide what it was, a cutting edge sports bike with performance honed for the street. But the R screams it. Suspension: Choosing the suspension wasn't just a case of looking for the best and bolting it on. Extensive testing by our own and Öhlins highly experienced development riders on road and track means the internals were developed specifically for Triumph and the Speed Triple R.	In the NIX30 forks and TTX36 shock, the rebound and compression damping functions are completely separated to give you more precise damping control and both offer a huge range of settings to suit your ride. Frame: The frame is the same doubled-tube, twin spar design recognizable from the 1997 model. Although the current version was updated back in 2011, so it now uses the engine as a crucial frame component, making the chassis stiffer and lighter for a more focused ride. Brakes: We’ve added Brembo monobloc calipers to the R for 5 percent more stopping power than the standard Speed Triple's Brembos. And their 1-piece construction helps reduce distortion at extreme pressures for more accurate feedback. The optional electronic ABS makes 100 calculations per second to prevent wheel lock up at either end. Wheels and Tires: We fitted lightweight cast aluminum wheels and a wide 6 in. 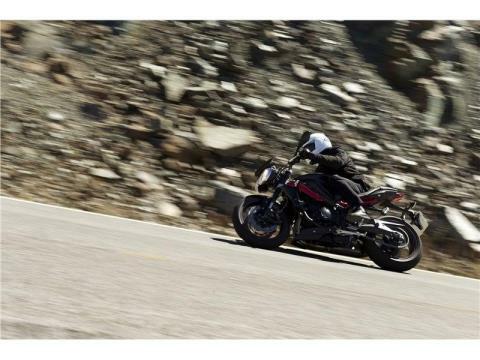 rim on the back to take the grippiest, sports-focused rubber the Speed Triple R deserves. Swingarm: The swingarm is aluminum and features an eccentric chain adjuster so that the rear wheel stays perfectly in line with the front for a focused, precise handling. Riding Position: The Speed Triple R is pure sports bike with a real world edge. So we designed the riding position for accurate control and aggressive performance in everyday riding situations. We set the bars low, the footrests in a rear set position and the seat is deeply shaped to keep you in position during hard use but still allows you to slide off the sides of the bike. It's a forward biased stance essential for keeping weight over the front of the bike, so you can feel feeling exactly what the forks and tire are doing and explore cornering limits, shifting weight to keep the front end in contact with the ground. All from a road-going motorcycle that you can use in heavy traffic, slow speed town riding and occasional long distance trips. 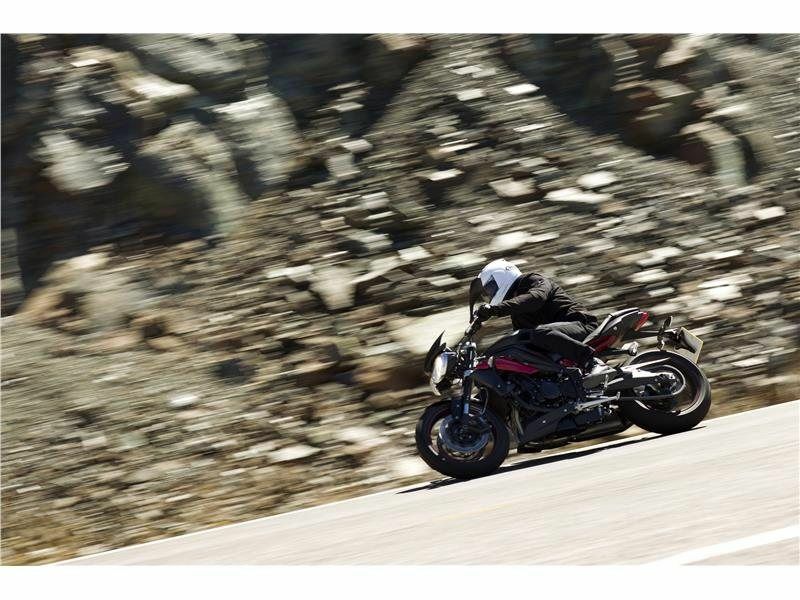 Performance: The engine is the same muscle-packed 1,050 cc triple that powers the Speed Triple. And it delivers a huge punch. 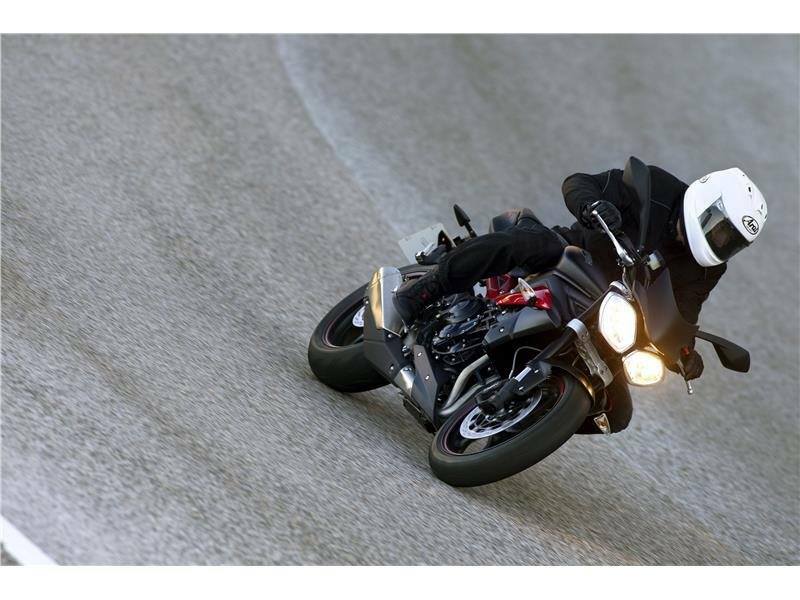 But every real rider knows, the key to its real world performance is the broad spread of torque and instant throttle response. With 135 PS maximum there’s enough high-end performance to satisfy you on a serious track day. 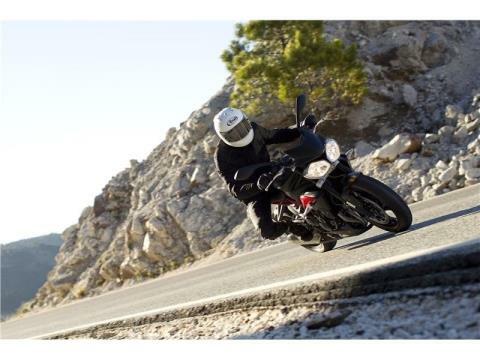 Then there’s the Speed Triple R’s 111 Nm of peak torque, with lots more thrust on tap lower down the rev range no matter what the gear and a seemingly endless flow of power that's predictable and easy to use. Configuration:	We matched the transmission carefully to the engine, with 6 ratios in the gearbox to make sure there's always one that's perfect at any moment of your ride. While the wet, multi-plate clutch has a lightweight and predictable lever action to make fast getaways easy and town riding effortless. Exhaust: The twin silencers, wrapped in black exhaust heat shields, sit beneath the short, stubby tail section of the Speed Triple R and leave the rear wheel fully exposed on the right by the cool, single-sided swingarm. Not for looks, for real world sports bike riding. It just happens to look great. 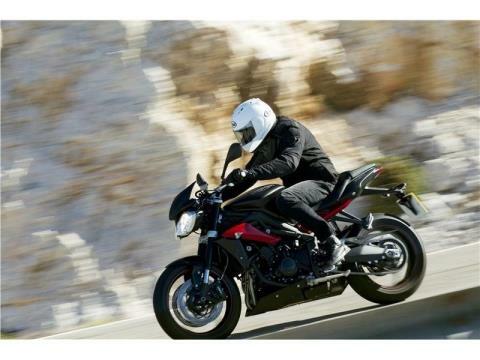 Immobilizer: We’ve made sure your bike is protected by a coded key immobilizer system, should your Speed Triple R attract the wrong kind of attention. It disables the ignition if it detects an attempt to turn or force the ignition switch without the presence of the electronically coded correct key. Instruments / Computer:	We added all the instrumentation a rider needs; including programmable gear change lights, service interval reminder, lap timer, trip computer and fuel gauge. All designed to be used by the performance rider, it's part digital, part analog and laid out in a highly intuitive fashion to make absorbing the array of information as easy and quick as possible.